January 28, The Iran Project – The heartbreaking fate of sailors aboard an ill-fated Iranian oil tanker that had been burning near China’s eastern coast for a week has been sealed. Iranian officials say the vessel has fully sunk, and that available evidence shows that all crew members died soon after it collided with another vessel and a powerful blast ensued. Iranian oil tanker Sanchi caught fire after it collided with the CF Crystal, a Hong Kong-registered bulk freighter carrying wheat from the US, about 160 nautical miles east of the Yangtze estuary. 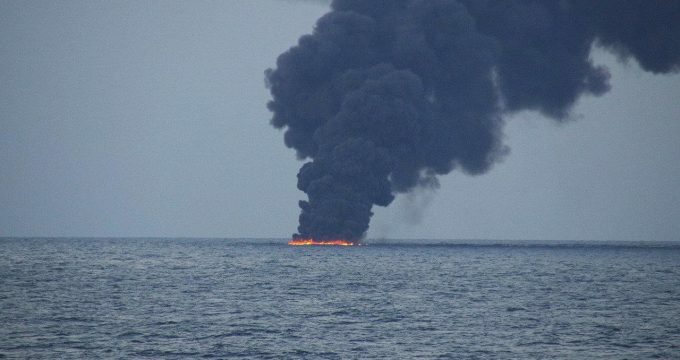 Mainstream media have focused largely upon the search for the tanker’s missing crew and the environmental ramifications of the worsening oil spill, particularly concerning the safety of seafood harvested from the East China Sea and the pollution of a major transit artery for many marine migratory species. Iran consul general in Shanghai said that the DNA tests taken from the bodies of the Iranian sailors killed in the Sanchi oil tanker inferno earlier this month have been sent to Tehran. The results of the DNA tests are to be compared with those from the families of the victims in Tehran. Deputy Managing Director of Iranian Ports and Maritime Organization for Maritime Affairs Hadi Haghshenas has announced that the investigation committee of the Sanchi oil tanker tragedy, comprised of representatives from Iran, China, Hong Kong, and Panama managed to wrap the questioning of the crew of CF Crystal freighter, in two groups, based on intended questions. He also recounted that the freighter was thoroughly inspected by the committee members to put the pieces of information together. Meanwhile, China’s ambassador to Iran Pang Sen said the Chinese officials and rescue workers did everything they could to handle the situation in a recent tragic incident. Sen noted that the Chinese government attached great significance to the recent incident for the Iranian vessel, saying even the Chinese president and the prime minister issued special orders following the crash. Highlighting the rescue attempts by the Chinese teams, the ambassador said the operation was hampered by huge flames, poisonous gas and rough sea. Apart from polluting common fisheries and breeding grounds for staple seafood, current simulations project that the oil plume will reach both the southwest coast of Japan and the pristine island of Jeju off South Korea within a month. Indeed, the spill has rapidly expanded, tripling in size according to some estimates. To compound matters, the refined oil carried by the Sanchi is largely invisible to the naked eye and kills microbes in the ocean that usually break down oil slicks. The tanker’s recent sinking has made clean-up efforts significantly more difficult, for not only has the refined oil become more difficult to access, but the Sanchi is now also leaking its own heavier fuel from the seafloor. Because there are so many unknowns in this situation—the size of the spill, its chemical makeup, where the chemicals from the oil will spread—it is difficult to predict what impact this spill could have on the environment. The fires and gaseous fumes resulting from its leak almost certainly killed off marine mammals, fish, and birds within the immediate vicinity of the crash, Nature reports. Unlike crude oil, which can create chronic environmental problems by sinking to the deep ocean and lingering there for years, hydrocarbon condensate is much lighter, evaporating or dissolving into water. That means short-term toxicity might be a bigger concern with this spill. The area where the ships collided is now known as the “new Bermuda triangle,” according to the Washington Post, because it is becoming increasingly dangerous: at least 33 ships were lost in the area in 2016. The black boxes for the tanker Sanchi and the freighter CF Crystal, the two vessels that collided in the worst oil ship disaster in decades, have been opened. Officials from China, Iran, and Panama were present when the black boxes were opened, Hadi Haqshenas, maritime affairs deputy at Iran’s Ports and Maritime Organization. “Clarifying the ultimate results of the deciphering process takes time and it could take months,” Haqshenas stated. The maritime authorities of China, Panama, Iran and Hong Kong signed an agreement to jointly investigate a collision in the East China Sea that caused the worst oil ship disaster in decades, according to China’s Ministry of Transport. Chinese government reports said oil from the Sanchi shipwreck that had spanned more than 300 km2 days earlier has now broken into smaller, “discrete” patches following a storm. The Chinese State Oceanic Administration cited monitoring data from Chinese Marine Police vessels on site combined with satellite remote sensing data in its most recent report. The group said teams on site reported “oil bands of 2 km in length and 1.5 km in width,” that “due to the effects of the wind and waves, were distributed in a discrete manner,” while satellite images found “a total area of about 93 km2,” containing oil with the largest being “about 36 km2”. The bodies of three crew members of Sanchi have been identified based on DNA tests, according to a report by the secretariat of the committee to investigate the oil tanker incident. The report identified the victims as Milad Aravi, Majid Naqian and Mohammad Kavoosi. The 30 Iranians and the two Bangladeshi sailors, who were crew members, were reportedly killed due to inhaling toxic gases.